UPDATE two months later: "Thank you for helping me. I've made 3 trips to Buffalo hospital in the past 2 months & am spending the day here with my dear sweet momma in surgery. I wouldn't/ couldn't have done all this without your help." ​"Anna is amazing, powerful, kind, deep, open-minded, grounded, excellent at listening and works with you in a way that is right for YOU. She personalizes her work in service to her client and their highest good and well-being without pretense or restriction. Anna holds a very safe space to open up and delve deep. I can't recommend her enough! I asked for assistance in something pretty "outside the box", and she was open, non-judgmental, and the take-away from the session is empowering and transformative in all ways, not just to the specific area I requested to work on." Anna is so wonderful. She helped me a lot with the issues I have been facing when interacting both in communication and expression from myself to the world. Anna gave me great communication statements with aspects to express to help me communicate my desires and wishes. She shared great insight about the type of communication introverts and extroverts like, as well as what these types seek. I feel so relaxed and expanded from having a hypnosis session with her. I can't wait to work with her again. LM left you a review on May 08, 2017:Anna is a wonderful Hypnotherapist. I'm a Hypnotherapist myself and I feel that it is important for me to practice what I preach. I like to set aside time for me to do my own personal work. Anna was the perfect person to help with that. She asked great questions and helped me get some really wonderful insights around the goal that I had set for myself. I definitely feel a nice shift. I look forward to working with her again. "The workshop Anna presented at the library’s staff development day, Changing Your Relationship with Stress, was enjoyable and packed with great tips. ...I also very much enjoyed the guided meditation. What a nice way to relax in the middle of a stressful day! When I opened my eyes at the end, everyone in the room looked so relaxed. It was very inspirational, and the handouts will serve as a good reminder of all of the ways one can diminish the negative effects of a stressful life." Anna’s workshops provided me the opportunity to learn and apply stress reduction techniques using guided meditation and self-hypnosis. After the sessions, I was able to use the handouts provided by Anna to continue to practice and to help me with a variety of stressors. Anna made this session relaxing, educational, and most importantly provided an effective tool that I was able to use to reduce my stress. And here's just a few examples from me of hypnosis in action! With no prior major health issues, a client suddenly found they were going to need surgery, and quick! The client naturally felt nervous. 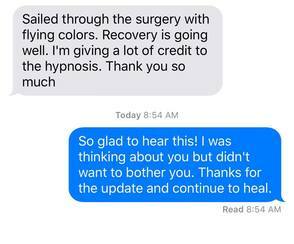 We did a pre-op hypnosis session and the client left feeling relaxed and confident. Research shows that hypnosis helps people get through surgery better. Client came in with pain level 8, left with level 3! I had the opportunity to do two pre-operative hypnosis sessions. Both clients were experiencing anxiety and pain at a level of 4. When the sessions were over, one client was down to a pain level of 1 and the other was at zero! Each felt much more confident about their upcoming surgery as well. I am currently taking an advanced course in pain management and I am looking forward to helping many others with this very common and very debilitating issue.